We offer a wide sphere of courses ranging from accredited programmes to one off self-improvement audios and books. Our courses are merely suggestions to stimulate your mind, body & spirit and show you what you can be. ​Your life's work is to find your own muse and the things which absorb and stimulate you. ​Dig deep, stay strong yet let your mind stay forever fertile and flexible to what you may become. You are a conqueror after all. 'I am your teacher and you are learning in my school. your aim is to learn and diligently practice all these things. Let go of the past. Anyone Who Wants To Change Any Area Of Their Life, (Regardless Of What It May Be) Should First Focus On Their Confidence Before They Do Anything Else. Dr. Steve G. Jones, Ed.D. has been helping people improve their lives through hypnosis for over 25 years. He simply states our reality is nothing more than our perception of reality. And our perception of reality is created within our subconscious mind. Therefore, the key to creating the reality that you desire is to program your subconscious mind to manifest that reality. While the concept itself is simple, getting people to do this can be easier said than done. And the reason behind this is that without even realising it, the subconscious mind is so strongly programmed, that changing it almost seems impossible. And when you’re dealing with something like confidence, things can get even more trickier. Reason being is that confidence is nothing more than belief in oneself and one’s powers or abilities. And this is why confidence really governs every attempt at programming the subconscious mind for success. Without confidence in yourself you may as well save your money and time in achieving anything worth while in life. It really is that important. Our lives are shaped by the decisions that we make and the decision to act is fuelled by confidence. Find out more and conquer confidence once and for all Click Here! Step into greater awareness on a journey into self-discovery and higher consciousness. Tune into your soul, understand your purpose, and develop techniques for long-lasting well-being. ​Deepak Chopra, M.D. and the whole Chopra Center family are thrilled to share strategies to reduce stress, practices to promote total well-being, and a transformative experience of self-discovery, higher consciousness, and awareness. The best part is you can access this program from anywhere in the world! It includes an exclusive mix of enlightening video and audio content from Deepak Chopra, M.D., guided meditations, and more. These 13 lessons taught by Brian Tracy will launch your speaking career. ​There is no such thing as a natural born speaker. All the skills required to be a powerful speaker are learned skills. The #1 reason why most people don't ever and will never succeed as a public speaker. Learn to do this one thing the right way and you'll already be further ahead than 50% of your competition. How to establish your authentic voice so you can connect deeply with the emotions of your audience. Change your life through learning. Over 40,000 courses are £10 each for a limited time. ​Learn a new skill in the comfort of your home and change the direction of your life. Courses by the master of life coaching Tony Robbins. You deserve to have a vibrant and fulfilling life. Tony will coach you through these life changing principles. All we ask is you promise to open the box and actually listen. If you simply commit to doing that, YOU WILL SEE RESULTS. So, make a decision to maximize who you are, what you’re capable of, and what you get to enjoy out of this life. But don’t just listen to this program, DO IT! If you start the program and don’t feel like it is working for you, you can return the entire system at no cost to you within 30 days of purchase. Every winter Pema Chödrön leads a retreat for the thirty residents of Gampo Abbey, her home in Cape Breton, Nova Scotia. This self-study course offers a special opportunity to be a part of one of these retreats, made available to you exclusively through Shambhala Publications. Join Pema in this intimate setting as she explores, in her usual down-to-earth and practical way, the Buddhist teachings that get to the heart of how our sense of self develops and functions. We’ll learn about the five skandhas—the elements that come together to form our experience of the self—as well as the twelve nidanas—the links of dependent origination that describe how the sense of self cycles from birth to death in every moment, creating habits of reactivity that hook us and cause us pain. ​Throughout history, the vast majority of people around the globe have believed they have, however defined, a “soul.” While the question of whether the soul exists cannot be answered by science, what we can study are the causes and consequences of various beliefs about the soul and its prospects of surviving the death of the body. 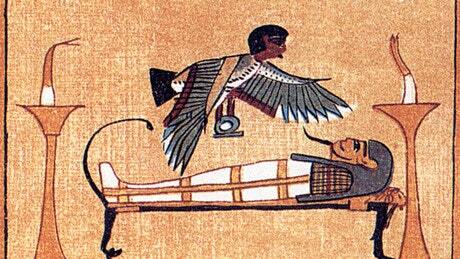 Why are soul and afterlife beliefs so common in human history? Are you a course creator? ​Get in touch with us.